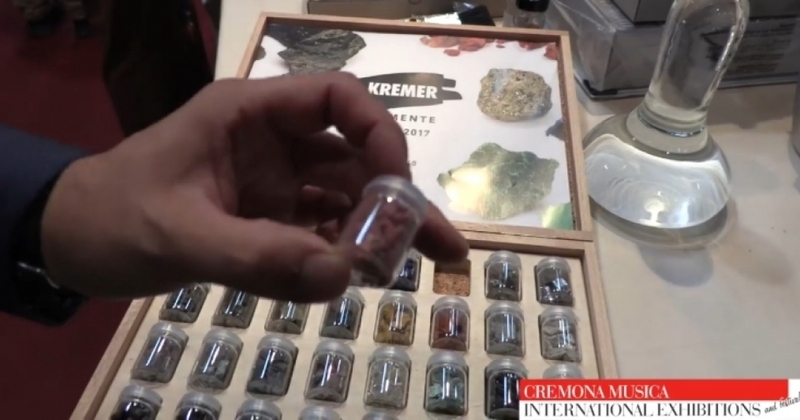 Cremona Musica's visitors certainly know Kremer Pigmente, the German firm that produces pigments, varnishes, oils and other product to color instruments and much more. We interviewed David Kremer to find out more about this fascinating world and about how the color of your instruments is made. What are the main features of a high-quality pigment? First of all, the light fastness should be perfect. Then there should be a resistance in the binder. And the pigment should reach exactly the shade which the customer wants. How do you replicate the colors of the strings of the Great Masters, such as Stradivari or Amati? The difficulty is to achieve the exact colorfulness of the historic crimson of Stradivari or Amati. These original paints are less lightfast than the modern synthetic pigments. Besides the ingredients, what are the main differences between natural and synthetic pigments? Pigments are fundamentally differentiated in chemistry into natural substances and substances synthesized by man. The first synthesis processes already existed in the Stone Age. Here, for example, black charcoal was produced with the help of fire. The burning of yellow in red ochre goes back to this time. In addition, one differentiates between historical and modern pigments. Modern pigments are colloquially called from the 18th century. The majority of these modern pigments are synthetically derived and can be divided into mineral pigments and organic pigments. Also, about half of the historical pigments were synthesized. To a greater extent, historical pigments still occur today in the form of natural iron oxides, bone black, yellow and red ochre, as well as manganese ores. However, the market share is very low. More than 90% of the pigments available on the market today are modern, synthetically produced pigments. They all have the properties that allow a technical processing in large quantities. These pigments produced by the paint industry have very consistent shades, quite in contrast to the pigments from nature since natural minerals vary in their color according to their origin. The lighting also has an effect on the luminosity of natural pigments, as their crystals reflect the light more strongly on the surface. Which are your best-sellers products? On the one hand, resins, oils and solvents, from which violin makers themselves make their paints and on the other hand, glue to adhesive wood together. Many customers also buy primers to obtain similar brownish primers as Stradivari. We also sell many paints and a variety of historical and modern pigments. Recently you also published the “Kremer Pigmente Recipe Book”, can you tell us what is it about? The Kremer Pigmente Recipe Book shows how to find the desired pigments and materials for their individual application. The recipes are divided into 6 categories: water color, tempera, acrylic paint, wall paint, oil paint and others. It is described in detail how to properly deal with the individual components such as pigments, water, emulsifiers or substrates, what problems can occur, how to avoid them, which proportions are optimal, which effects temperature fluctuations and weather conditions have and much more. Many special questions are dealt with, e.g. everything from painting oil on heavily-used wood to coloring concrete or epoxy resin to producing real rust. The textbook takes into account the latest scientific findings in its materials science. It is not only a must-have for artists, but also for anyone who is otherwise either professionally involved with colors or also likes to work creatively with colors in private life. What do you expect from Cremona Musica 2019? Are you preparing something special for the occasion? We are proud to be part of the exhibition for over 20 years now. Over the years we have established long-standing business relations with international professionals. It is our goal to maintain personal contact on site but also to introduce ourselves to new customers. For the Cremona Musica we will bring sample bottles of the new Primer GD (# 79720).